The Thrombostat is a Single Channel Automatated Coagulation Analyser. It is up-to date, processor controlled semiautomatic measuring instruments for in - vitro diagnostic blood coagulation analysis. 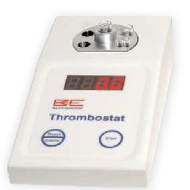 Its compact design and simple handling makes the THROMBOSTAT a powerful coagulometer. Determine PT, aPTT & TT coagulation parameters.